A couple of you have asked me to journal the process of opening Cook & Brown and becoming a professional bartender, so today I’ll begin a series of (I hope) weekly updates documenting the process. The first big news to announce is that the Bolins closed the deal on Friday, which means the restaurant is officially theirs. It was tricky to publicly discuss the location, since it was an operating restaurant. The owner told his staff on Tuesday, “Hey, we’re closing tomorrow; you’re canned.” But with that behind us, I can announce the location: 959 Hope St., Providence. Opening is scheduled no later than March 1. They’re operating as a new business and not a turnkey operation, so it’s not as simple as closing a few days to clean the kitchen. They need to repaint, make minor repairs, rebrand the exterior, thoroughly clean (especially the kitchen), hire staff, stock the restaurant and bar, etc. We could open sooner, and in fact they’re hoping to open somewhere around the 20th. One thing they’ve decided which I think is smart is to not shoot for Valentine’s Day. That’s only about 3 weeks away and would require everyone to rush too much. The last thing we want is to spoil a couple’s romantic evening by being unprepared. Bad hospitality, bad PR. With the restaurant in their hands, the Bolins welcomed Jen and I up for lunch yesterday afternoon. (Jen had the holiday off.) She was eager to meet them; after all, I’ll be seeing them more often than I will Jen after the restaurant opens, and she wanted to start to get to know them. As often happens when I meet up with Nemo, the conversation flew and we talked for hours. 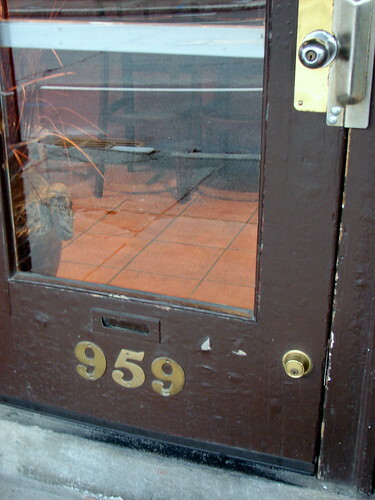 We wound up pitching in, using razor blades and elbow grease to scrape the Restaurant Oak decals from the windows, signaling to the neighborhood that things were changing. Alas, we had to cut the conversation short. Tomorrow’s our (fourth) wedding anniversary, and Jen needed to get home to start braising the oxtails we’ll have for dinner. Tomorrow, I’ll be back up there, with tentative plans to meet a friend who’s a distributor; he’s the guy who brought Bols Genever into Rhode Island and will shortly be distributing Haus Alpenz products here–a good man to know. I’ve been poring over cocktail books and the Rhode Island Beverage Journal for weeks, thinking about our opening cocktail menu, and it’ll be fun to sit down and talk about the practical aspects of alcohol distribution. Also, I’m working on staffing the bar, and getting a kickass team in place. More on that later. Congratulations! Can’t wait to see what happens next. Mike, If I ever get up that way I sure will drop in for a drink, on you!! Congratulations, indeed, and none too soon to see Oak’s headlights heading down the road. This is going to be a very interesting project to follow, I’m very glad you sharing it with us. Not going for valentines is a smart move. If everything is not 100% you don’t want to take the risk. Although it´s a busy night and good to make money, it´s too much of a special night to take the risk for an opening. By the way, happy anniversary. Keep up the enthusiasm and keep us updated! Best of luck to Cook & Brown, to you and the owners! Congrats on this new adventure. My in-laws live right up the road, and while we’ve enjoyed nights at Chez Pascal, we’ll be routing over to Cook & Brown. Good luck ! No Purplesaurus Rex Smirnoff? Damn. I’ll have to throw away all those great Purplesaurus recipes I found in Embury and Duffy. Oh my gosh, I’m kind of late to the post that reveals the location, but I COULD NOT be happier you’re taking over Oak! I always thought it was a great location (my mom lives right across from the park on Hope) and the food was … never quite living up… although it was always a nice dining experience. Cannot wait to swing by in March when I’m up visiting!